No matter which of the 50+ spellings of the surname Wyckoff you use (Wikoff, Wycoff, Wicoff etc. ), it is likely your lineage can be traced to one of Pieter and Grietje’s eleven children. In fact, it is believed that descendants of Pieter and Grietje now number in the tens (if not hundreds) of thousands. Despite some published claims to the contrary, including fanciful suggestions that Pieter Claesen descended from Swedish nobility, there is no documented information regarding either his birth or parentage. The Wyckoff Association’s fact-based history of Pieter starts with his arrival on this continent aboard the Rensselaerwyck in 1637 where he was listed on the passenger list as Pieter Claesen of Norden (located in East Friesland (Frisia), now West Germany). Recent research by M. William Wykoff and others strongly indicates that Pieter may have hailed from a small farming community in East Friesland called Wykhof (from whence he probably chose his surname in accordance with the regional custom at the time). Family Bibles, local courthouses, and the older members of your family are always a good place to start your search, but the Wyckoff Association has decades worth of genealogical submissions, including those found in previously published volumes and CDs, conveniently compiled into one searchable digital drive. The digital family tree genealogy is updated annually with new family members and information you provide. 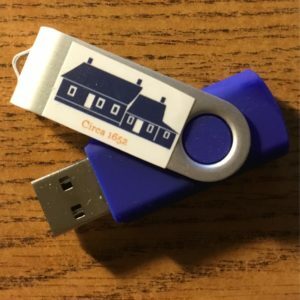 It is now available on a convenient thumb drive which can be ordered in the Museum Store. Our genealogist, Lynn Wycoff, is always accepting new submissions and updating existing records to ensure that each CD contains the most comprehensive Wyckoff family information available. Contact: Email Lynn your updated family information and/or digital corrections here. Please be sure to include dates, places, and sources for events and new information when available. Material for the notes section is an important part of our Wyckoff heritage (otherwise we just have a bunch of names and dates). Additional information might include education, military service, occupation/career, special awards, personal characteristics, interesting events, or places of residence. If you have further genealogical questions, please contact Lynn directly. Lynn has acted as the Wyckoff family’s volunteer genealogist for more than 30 years. She took on the Herculean task of inputting all the entries in the old orange book into the digital software. Throughout the year she fields inquiries from many cousins and continues to update the family tree with new submissions. We are looking for a cousin to volunteer and help Lynn out. If you are interested in serving as the Association’s volunteer genealogist, please let us know and we will be happy to discuss the opportunity further. Email the museum (info@wyckoffmueum.org) and Lynn.